Sugar tastes sweet for a good reason: it’s a fast and easy source of energy for our cells, so evolution has ensured that we’re happy when we eat it. Cells in our taste buds have specific sensors for sugar, rewarding us with a pleasant taste for sugary foods. However, other molecules can trick these sensors, giving us the reward but without the calories. These include small artificial molecules that resemble sugar, such as aspartame, and a variety of sweet-tasting proteins. Several intensely sweet proteins have been discovered in African plants, including monellin (PDB entry 3mon), thaumatin (PDB entry 1thv), and brazzein (PDB entry 2brz). Molecule-for-molecule, these small proteins are 100,000 times sweeter than sugar, so we only need tiny amounts of them to get the same sweet taste. When these proteins were first discovered, researchers hypothesized that they would have a little extension that would mimic a sugar molecule. When structures were solved, however, these were not seen, and the current theory sees them acting as a wedge to lock sweet receptors in their active conformation. Several other proteins discovered in tropical plants have an even more unusual property: they can change the taste of foods. Neoculin (PDB entry 2d04) and miraculin (not shown) can change sour foods into sweet foods. They have amino acids that change properties in acidic (sour) environments, and then stimulate our sweet receptors, making us think we’ve eaten something sweet. Gurmarin (PDB entry 1c4e) has just the opposite property—it is a taste suppressor that blocks the sensing of sugar, so sweet foods don’t taste sweet at all. Several amino acids on the surface of monellin (shown here in magenta) are important for its sweet taste. 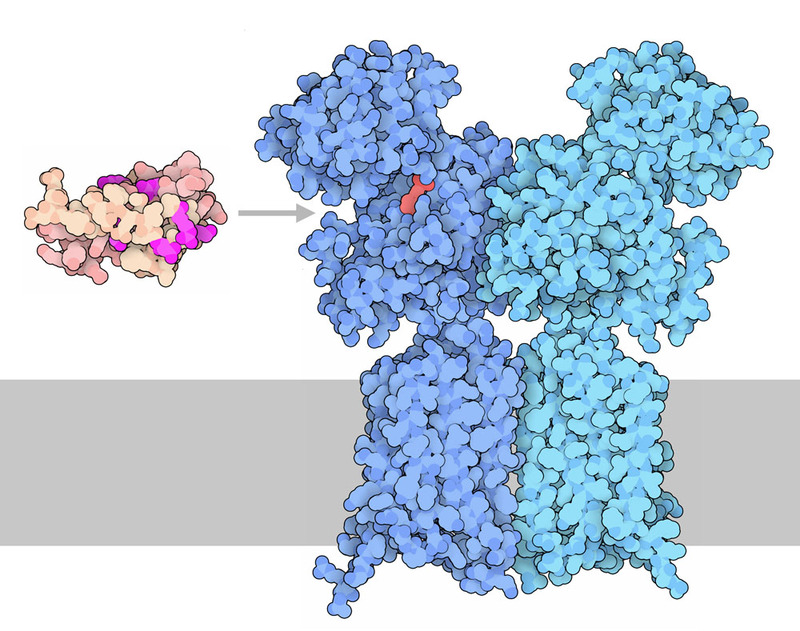 It is thought to bind to sugar-sensing cleft of sweet taste receptor, which is similar to the glutamate receptor (shown here in blue). Our sense of sweet taste is managed by a single type of receptor, called TIR2/TIR3, which is similar in structure to the glutamate receptor shown here (PDB entries 2e4z and 4or2). It is composed of two parts: a domain on the outside of the cell that binds to sugar and a typical GPCR domain that crosses the cell membrane, delivering the signal inside. Monellin and other sweet-tasting proteins are thought to bind in the large cleft that surrounds the small sugar binding site, tricking the receptor into thinking that sugar has bound. Since it’s so sweet, monellin would be great for creating diet foods, since only a little is needed. However, it rapidly loses its sweetness when heated, so it’s not much good for baking. To solve this problem, researchers have engineered new heat-stable forms of monellin by connecting its two chains. To explore natural monellin (PDB entry 3mon) and two engineered single-chain forms (PDB entries 1mol and 1fa3), click on the image for an interactive JSmol. Thaumatin is often used as a test system when researchers are developing new methods for protein crystallography, since it is readily available and easily forms crystals. Try searching for “thaumatin” to see some of the ways it has been used. The proteins lysozyme and mabinlin also taste sweet, although not as sweet as the proteins shown here—try searching for them to explore their structures. 4or2: H. Wu, C. Wang, K. J. Gregory, G. W. Han, H. P. Cho, Y. Xia, C. M. Niswender, V. Katritch, J. Meiler, V. Cherezov, P. J. Conn & R. C. Stevens (2014) Structure of a class C GPCR metabotropic glutamate receptor 1 bound to an allosteric modulator. Science 344, 58-64. D. Picone & P. A. Temussi (2012) Dissimilar sweet proteins from plants: oddities or normal components? Plant Science 195, 135-142. 2e4z: T. Muto, D. Tsuchiya, K. Morikawa & H. Jingami (2007) Structures of the extracellular regions of the group II/III metabotropic glutamate receptors. Proceedings of the National Academy of Science USA 104, 3759-3764. P. A. Temussi (2006) Natural sweet macromolecules: how sweet proteins work. Cellular and Molecular Life Sciences 63, 1876-1888. 2d04: A. Shimizu-Ibuka, Y. Morita, T. Terada, T. Asakura, K. Nakajima, S. Iwata, T. Misaka, H. Sorimachi, S. Arai & K. Abe (2006) Crystal structure of neoculin: insights into its sweetness and taste-modifying activity. Journal of Molecular Biology 359, 148-158. 1fa3: R. Spadaccini, O. Crescenzi, T. Tancredi, N. De Casamassimi, G. Saviano, R. Scognamiglio, A. Di Donato & P. A. Temussi (2001) Solution structure of a sweet protein: NMR study of MNEI, a single chain monellin. Journal of Molecular Biology 305, 505-514. 1c4e: J. I. Fletcher, A. J. Dingley, R. Smith, M. Connor, M. J. Christie & G. F. King (1999) High-resolution solution structure of gurmarin, a sweet-taste-suppressing plant polypeptide. European Journal of Biochemistry 264, 525-533. 2brz: J. E. Caldwell, F. Abildgaard, Z. Dzakula, D. Ming, G. Hellekant & J. L. Markley (1998) Solution structure of the thermostable sweet-tasting protein brazzein. Nature Structural Biology 5, 427-431. 1thv: T. P. Ko, J. Day, A. Greenwood & A. McPherson (1994) Structures of three crystal forms of the sweet protein thaumatin. Acta Crystallographica D50, 813-825. 1mol: J. R. Somoza, F. Jiang, L. Tong, C. H. Kang, J. M. Cho & S. H. Kim (1993) Two crystal structures of a potently sweet protein. Natural monellin at 2.75 A resolution and single-chain monellin at 1.7 A resolution. Journal of Molecular Biology 234, 390-404. 3mon: Kim S. H., de Vos, A. & Ogata, C. (1988) Crystal structures of two intensely sweet proteins. Trends in Biochemical Sciences 13, 13-15.